The 25th anniversary of Rubik’s Cube was marked with a print advertising campaign from New Zealand featuring adults who have clearly been puzzling over the puzzle for 25 years. We’re given a few clues regarding the passage of time. Decor includes floral wallpaper, sheepskin rug, ducks on the wall, Grand Prix bedspread. The Rubik’s Cube puzzlers have, to some extent grown out of their clothes, though their underwear appears to have stretched over time. Toenails and illfitting shoes go together with long, long hair (except of course on the woman’s legs). Rubik’s Cube was invented in 1974 by Hungarian sculptor and professor of architecture Ernő Rubik. The ‘Magic Cube’ was renamed ‘Rubik’s Cube’ by Ideal Toys in 1980. So was the 25 years referring to 1999 or 2003? Or is this the celebration from 2007? 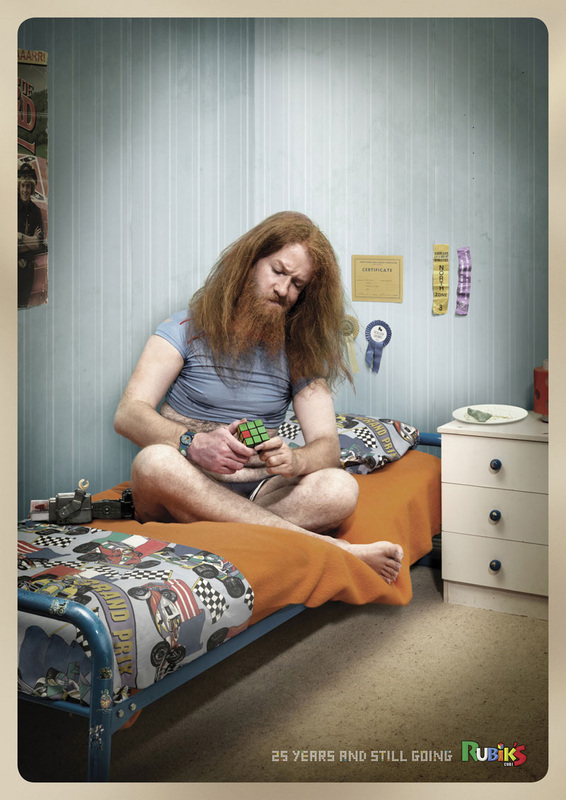 The Rubik Anniversary campaign was developed at DDB New Zealand, Auckland, by executive creative director Toby Talbot, head of art Mike Davison, creatives Bridget Short and Regan Grafton, senior agency producer Gordon Moir, and photographer Juliet Taylor.